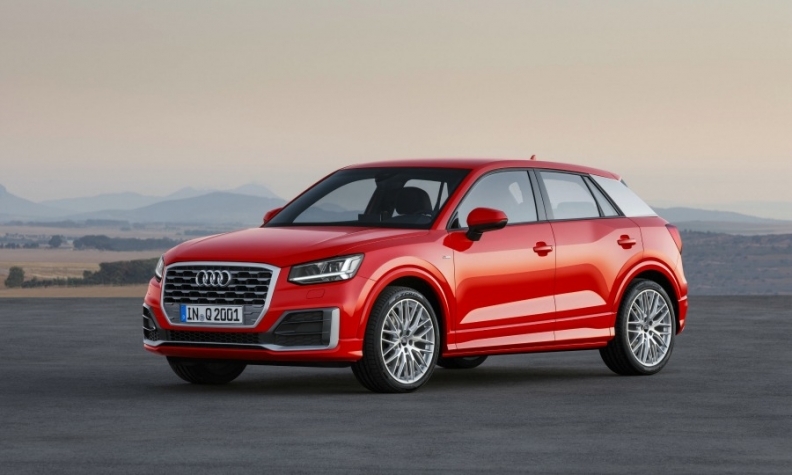 New product launches such as the Q2, shown, are weighing on Audi's earnings. BERLIN -- Audi expects to keep profitability high this year even as spending on factories and new models weigh on earnings. First-quarter operating profit slumped 15 percent to 1.2 billion euros ($1.34 billion) after deduction of 100 million euros of provisions for possible further recalls of cars fitted with Takata Corp. airbags, Audi said in a statement today. Operating margin fell to 9 percent from 9.7 percent. Volkswagen Group's luxury brand will launch its new Q2 SUV this year and is expanding its manufacturing base. A new Brazilian factory came on stream last October and a 1 billion euro plant in Mexico is due to start building the Q5 SUV in September. "We are safeguarding profitability targets through vigorous cost management," finance chief Axel Strotbek said without elaborating. Audi aims to keep its operating margin within a target range of 8-10 percent this year after it dropped to 8.3 percent in the January-March period from 9.7 percent a year earlier. Luxury car sales champion BMW posted a 9.4 percent operating margin in its automotive business while Daimler's Mercedes-Benz division reported 7.1 percent. Audi has postponed construction of a new wind tunnel to test aerodynamics and is reviewing other projects to create leeway for spending on electric cars and digital features, a spokesman said.